Thinking of Queensland? Why not consider Cairns? 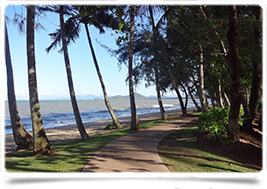 Check out Palm Cove – you won't be disappointed! After visiting other Queensland cities, the practices I visited in Cairns were the busiest we’ve seen. Doctors are fully booked and are all earning very comfortable incomes. Cairns has a year-round tourist population and a growing Australian and expat community. Many of the residents we met said that they had come for a visit and had never left! Thinking of Queensland? Think of Cairns!